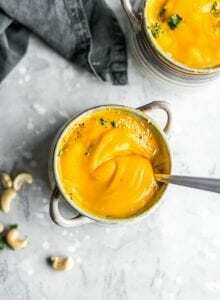 This beautiful, slightly sweet and perfectly creamy spiced soup is perfect for Winter meal prep or a quick and easy, healthy plant-based meal. Add the garlic, onion and ginger to a soup pot with a few tablespoons of the vegetable stock and let cook over medium heat until starting to soften. Stir in the red curry paste, stir well and cook for a few more minutes. Add the stock, squash and carrot. Simmer lightly until the squash and carrot are fork-tender, approximately 20-25 minutes. Carefully add the cooked soup to a blender or use an immersion blender in the pot to blend until smooth. Alternatively, you can leave about 1/3 of the soup behind for a chunkier soup. Pour the blended soup back into the pot if you used a blender and stir in the fresh lime juice and coconut. Start with 1/2 cup of coconut milk, then add a little more if needed to reach desired thickness. The soup thickens up quite a bit next day. To adjust the consistency, stir in some vegetable broth or water.